Bolidt is a renowned worldwide expert in developing, producing and applying synthetic flooring, decking and associated systems for vessels in various marine market sectors. This includes cruise ships, ferries, naval vessels and high-quality yachts, as well as offshore vessels and livestock carriers. Since 1964 the company, based in the Netherlands, has set the standard for shipdecks and interior spaces, meeting customer requirements in five key areas: sustainability, hygiene, aesthetic design, safety and weight-saving. These are the pillars on which Bolidt’s product range for shipbuilding and refit applications have been built. When Bolidt was established just over 50 years ago, the company’s founders believed there was untapped potential for the use of synthetic materials in many markets, including shipbuilding. They had a strong belief, which has proved correct, that traditional materials could be replaced with thermosetting synthetic products. By keeping product development, production, sales and processing in-house, Bolidt has successfully distinguished itself from other suppliers. As a result of this strategy, the company is less dependent on external suppliers than others in this market, and is able to offer a comprehensive in-house services, from initial product research through to application on ships. The highly durable nature of Bolidt’s products, which enables them to sustain their appearance and quality over many years, has been one of their primary selling points in the marine sector over the past five decades. The strength of the materials on offer are in fact amongst their main attractions in the marketplace. All of Bolidt’s products are suitable for use in marine environments, extremely wear-resistant, and easy to maintain. Due to the elasticity of the synthetic materials used, Bolidt’s flooring and decking systems are very crack-resistant. Many are also highly resistant to corrosive materials. Bolidt’s marine products are also extremely hygienic, as they are pore-free and easy to clean. This makes them particularly well suited for use in on-board areas, such as ship’s galleys or restaurant spaces, where hygiene, and the prevention of contamination and the spread of harmful organisms, is an important issue. Safety is invariably a top priority for shipowners and operators when specifying materials for use in ship construction or refit projects. Bolidt’s marine materials are fire-resistant and designed to prevent passengers and crew slipping in wet conditions. They also have sound attenuation qualities to reduce noise pollution levels. Products have been accredited to ISO 140-8:1997 acoustics standards, among others. While functionality is important when specifying decking and flooring systems for vessels, so are appearances. Bolidt’s thermosetting synthetic materials score highly in meeting shipowner requirements for aesthetically pleasing environments onboard, as well as offering more practical benefits. As Bolidt’s synthetic materials are applied in liquid form, a seamless and smooth surface can always be created. Products can be supplied in a wide range of colours, with patterns and even 3D effects. The aesthetic possibilities are in reality almost endless. Bolidt’s synthetic products are significantly lighter than alternative solutions. The company’s R&D department continues to refine and develop materials to reduce overall weight, to the benefit of shipowners and shipyards. The company has recently developed an advanced screed levelling resin that is 20% lighter than previous generation products. Weight savings are important for shipowners and operators as this helps reduce fuel consumption. As a result, Bolidt products can help reduce costs, while lower levels of harmful emissions benefit the environment. Over the years Bolidt has achieved tremendous success in the cruise sector in particular. The company has supplied flooring and decking materials to many of the leading cruise shipping brands and has a significant share of the current cruise new building market. Bolidt products have been used on cruise ships for sun decks, lido decks, balconies, swimming pools and helicopter decks, as well as interior flooring and specialist surfaces, such as galley flooring. Bolidt’s aesthetically pleasing, and hardwearing products, have also proved popular in the super yacht sector, where they have been used for exterior decking, stairs, tender garages and other areas. 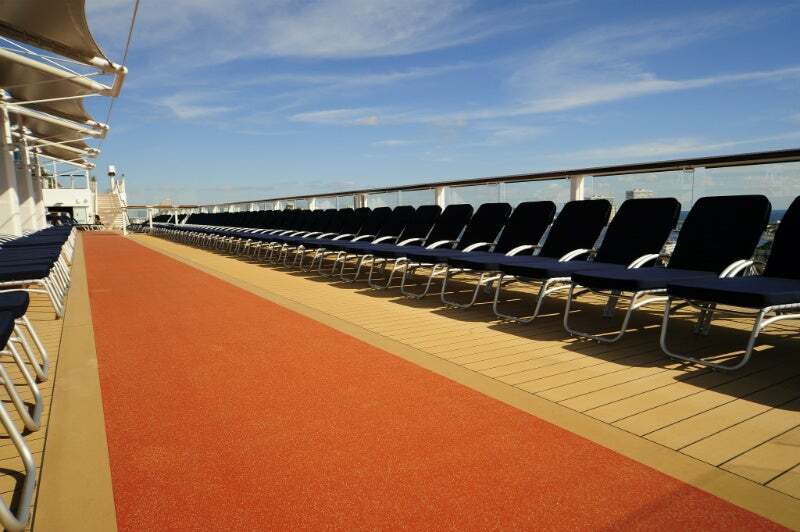 Its decking and flooring products are also a feature of the river cruise liner and ferry market. Another shipping market where Bolidt has been present since the outset is the naval sector, where the ability of Bolidt products to withstand high forces, as well as their ease of maintenance and hygienic qualities, have led a number of navies worldwide to use Bolidt products in both mission critical areas, and spaces used by crew on-board. Bodily products have also been utilised on offshore support vessels and livestock carriers. Bolidt supplies products for both the exterior and interior areas of passenger ships, yachts and naval craft. For outer deck spaces, Bolidt has a number of products in the Bolideck range which it recommends, all of which are extremely durable, low-maintenance, fireproof and can be supplied on site by Bolidt’s own specialists. For inside spaces Bolidt similarly offers a wide range of Bolideck solutions to fit specific end user requirements. A further marine product that has been hugely successful for Bolidt in recent times, in both interior and exterior areas of passenger ships and yachts in particular, is Bolideck Future Teak, an environmentally-friendly and realistic alternative to traditional teak decking. Since its introduction in 2005, it has become a firm favourite amongst cruise ship operators and designers in particular. Recent references for this product have included Norwegian Escape, Harmony of the Seas, Koningsdam and AidaDiva. Bolideck Future Teak is a durable and lightweight synthetic decking system, which looks and feels much like real teak. It allows designers to deliver the high-end quality ambience required on cruise ships at the same time as being ecologically responsible and easy to maintain. Teams from Bolidt Synthetic Products & Systems will be busy throughout 2016 installing decking systems on a number of high-profile newbuild cruise ships. AvA Yachts is building a new explorer motor yacht named KANDO at its shipyard situated in Antalya FreeZone, Turkey. The Damen ASD 3212 series of azimuth stern drive tugs are being built by Damen Shipyards Group in accordance with the requirements of push-pull, escorting, towing and fire-fighting operations. SeaXplorer 75 is a SeaXplorer expedition yacht being offered by Damen Shipyards Group in co-operation with its affiliate AMELS, for operations in icy conditions and remote tropical areas. The YS 5009 range of yacht support vessels are being offered by Damen Shipyards Group and AMELS to meet the requirements of superyacht owners. Texelstroom is a sustainable, new-generation ferry built at LaNaval Shipyard, Spain, for its operator and owner Texels Eigen Stoomboot Onderneming (TESO). The Norwegian Epic, the third largest cruise ship in the Norwegian Cruise Line (NCL) fleet, recently spent several months in drydock at Damen Shiprepair in Brest, France. The purpose of this visit was to undergo a refit and maintenance.